Cruise Ship, All-Inclusive Resort, or Private Charter? Spoiler alert--it’s not even close! The average passenger capacity of an ocean liner is around 3,000. 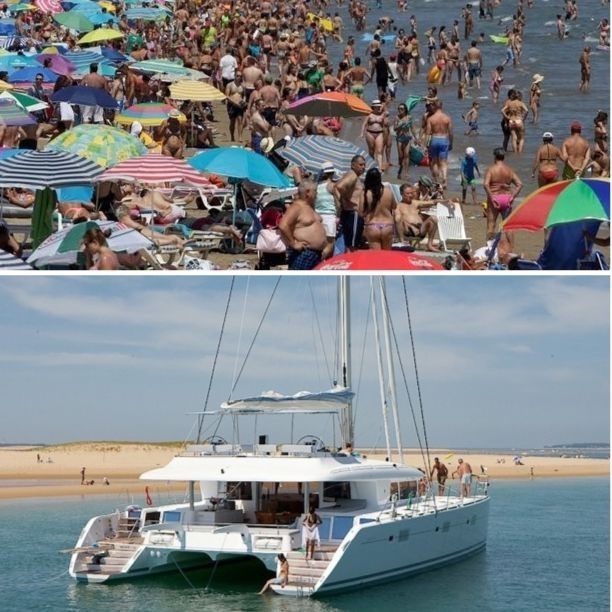 Compare that to a luxury cruising catamaran, Lagoon 620 (occupancy 12), and you’re looking at 2,988 less boatmates. If you choose a mega ship, expect to see lines for the lunch buffet and crowded pools. On your own private yacht expect to see your own private diving spots and plenty of prime sunbathing real estate. 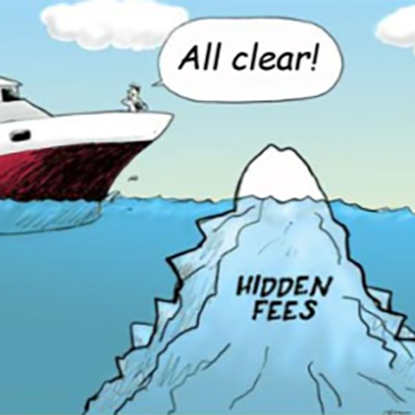 On a cruise ship, your fare covers your passage on the ship and food--that’s it. Pay extra for: port transportation, specialty restaurants, shore excursions, alcohol, soda, or gratuities (many cruise lines automatically charge steward and waitstaff tips to your credit card). On a chartered cruise, “All-Inclusive” means your fare includes: a captain, a private chef, all your meals, alcohol and yes, even soda. You choose the meals, you choose how much to tip. And since the crew is only two people, your gratuity goes further. Feeding so many people while boasting an enormous smorgasbord has come at a cost. The quality of the food on ocean liners has suffered (or wilted and yellowed, to be more exact). On a crewed charter meals are tailor-made to fit your desires. Snacks and cocktails are served as much as you’d like, and if you go ashore the cook will send you off with a boxed lunch! The largest cruise liner operating these days holds more than 6,700 people. When you’re sharing a vacation with that many folks, you should expect to have a difficult time procuring that choice deck chair. And when you do, you may find yourself basking in the din of screaming children and overly intoxicated strangers rather than in the solace of the Caribbean sun. On a chartered cruise, the people you’re sharing the boat with are your friends or family members! It’s like your own exclusive (yet all-inclusive) floating resort! Are you looking for an all-inclusive vacation to the Caribbean islands? Want to be pampered? Perhaps you have considered an all-inclusive resort or a cruise ship? Have you ever considered a crewed yacht charter? We’ll help you compare the all-inclusive options and show you how to vacation like the rich at a price you can afford! Click here to see an in-depth comparison of these different types of all-inclusive vacations. 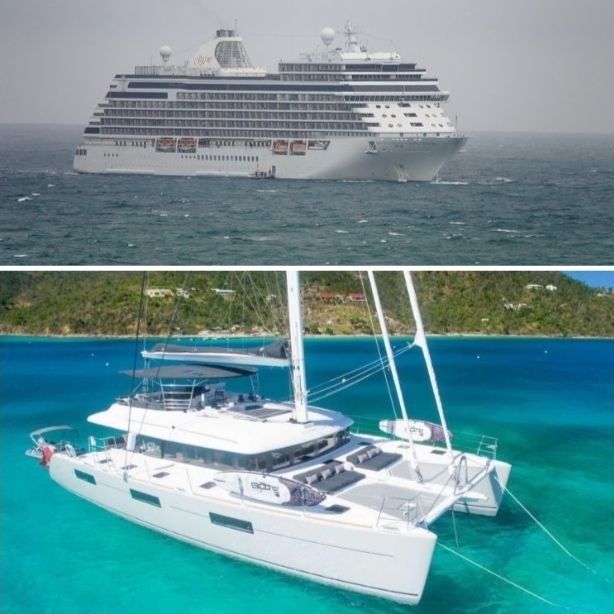 If you want to get the best advantages of all-inclusive resorts and cruises all in one vacation with added flexibility, privacy, and pampering consider a catamaran yacht charter. For the first-time charterer, we highly recommend the British Virgin Islands with its calm waters and islands located near one another. Our most popular crewed charter is on a stunning Lagoon 620. For those unfamiliar with catamarans, this luxury yacht is a 62’ boat with 5-star accommodations for up to 12 guests in 6 double, air conditioned, en-suite, comfortable staterooms. The charter includes all meals prepared according to the guests’ preferences, all drinks and refreshments including alcoholic beverages, and your choice of destinations and activities. Your captain and chef make your all-inclusive dream vacation a reality. Our friendly, knowledgeable staff will gladly talk, text, or email with you to help you imagine yourself enjoying a catamaran sailing vacation with your family and friends. Unlike the average cruise ship vacation, a catamaran sailing vacation is all-inclusive and very exclusive. No extra charges for food prepared based on your preferences. No charges for soda, cocktails, or wine. Plus, perhaps the best feature of a yacht charter, you have the ability to decide where and how often you stop and choose activities you want to do. Choose to stay in one locale longer, or set sail to the next one sooner. You can choose to stop at a resort for the day or be alone at a deserted beach or any combination in between. Aboard your very own crewed catamaran for a week with your attentive captain and cook, you take your all-inclusive resort with you wherever you want to go. Note we do not offer by-the-cabin bookings so your yacht is all yours to share only with your family and friends. Want to wake up and walk a new beach every morning? You can do that on a yacht. 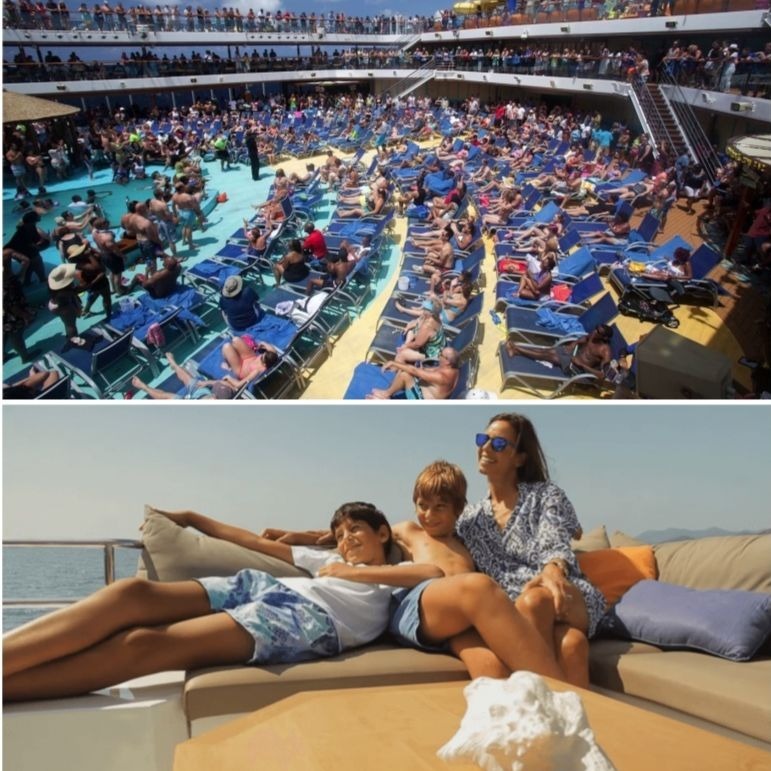 At an all-inclusive resort, you have the same beach every day and aboard a cruise ship if you are shuttled to a beach, you will share it with thousands. Our Lagoon 620 Crewed Yacht Charter – our always-discounted owner time rates for a fully provisioned luxury yacht with captain and chef. Excursions Select from a list hoping to get what you want. Or DIY on the pier hoping you return to the ship on time. Additional cost as well as food and beverages. This can easily be $100 per person per port-day, so add another $400 to cost per person. Select from a list or plan an outing on your own. In most cases, trips outside the resort are additional as well as food and beverages. Let’s say you plan at least one outing, add another $150 to cost per person. Do you want to do in the water or ashore. 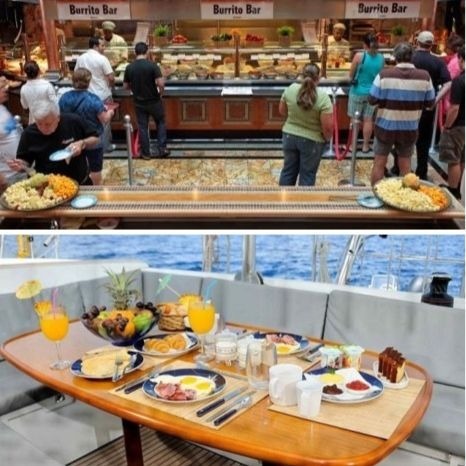 Entry fees and any food or drink you want ashore is extra, but returning to the boat for lunch or dinner is really. If you visit a restaurant ashore and a couple of paid attractions, add another $70 to cost per person. Other Extra Costs Extra: Airfare, port transportation, sodas, juices, bar, gratuities (many cruise lines automatically charge steward and waitstaff tips to credit card). Add another $250-$1,000+ per adult and $50-100+ per child. Included: Frequently port transportation, all food and beverages on resort property. Extra: Airfare, gratuities in the amount you decide. Included: All food and beverages on board as well as picnics or box lunches brought ashore. Extra: Airfare, gratuities in the amount you decide, fuel. Itinerary Set itinerary and due to large crowds, pier regulations, and ship’s timetable, a rigid departure schedule. Back late from a DIY excursion and you are left behind. You set the pace of what resort activities you want to participate in. But, some resort excursions and activities may be scheduled when you would rather be doing something else. Your crew are your personal concierges. You pick your destinations. You pick when you arrive and when you depart. Stay longer if you like, leave sooner if you prefer. Food Quality & Selection A variety of choices including multi-course meals at a set dining time, buffets, and snack bars at varying qualities. Also, in most cases, gourmet specialty restaurants are available at additional cost. A variety of choices including multi-course meals at a set dining time, buffets, and snack bars at varying qualities. Also, in most cases, gourmet specialty restaurants are available at additional cost. Each guest’s food preferences are taken into account when your personal chef prepares a gourmet meal. Even afternoon snacks and cocktails are an event to remember. Going ashore? Chef will make a delicious box lunch for you. Nighttime Entertainment Included: In-cabin TV and movies, variety shows, movies, dance clubs. Extra: Arcade, casinos, drinks in the clubs, some on-demand in-cabin movies. Included: In-cabin music and video games, star-gazing, up-close marine life, throw a dance party, catch a beach party perhaps a full moon party. Extra: Food and drinks while ashore, attraction entry fees, and, if applicable, foreign port entry fees. For the Kids Daytime programs in large age groups. Daytime programs in large age groups. Let the captain know what the kids feel like doing today or in the next hour…and there will be a pirate tale or two and custom kid activities! Pool Several on board Several on property Step outside your cabin and jump in. But, if you really prefer a pool, ask the captain to moor near a resort. For a nominal fee, you can enjoy the pool and spa services. Spa On board. Service fees extra. On board. Service fees extra. Ask the captain to moor near the spa or resort of your choice. Experience multiple spas on your trip. Resort and service fees extra. Activities You and several thousand others can choose from a wide variety of onboard activities from fitness to bowling and movies to pools and water slides. Some ships offer incredible attractions like surf pools or water parks as you wait your turn. Kayaking, paddleboarding, going ashore, snorkeling, and other activities have to wait until you are in port and everything is extra. Lots of water sports, beach lounging, fitness, and entertainment. Some even offer unlimited SCUBA, golf, and other sports like tennis. So pick a resort that has the activities you love, because engaging in other activities not on property are extra and often not available. Tons of water sports such as kayaking, paddleboard, and snorkeling right outside your cabin door. Lounge on a deserted beach or join the party at a beach bar. Go ashore for a round of golf or tennis match. SCUBA or snorkel the best remote and exclusive spots or arrange a dive boat to pick you up. Your boat takes you to the activities you want to enjoy in your charter locale. No matter what you choose, your boat will be waiting for your return when you are ready.